If you’re like me, you like to knit and crochet what you can use or give in the relatively near future (if not the immediate present). So, while it is always fine to start a months-long journey into a fair isle cardigan, it might be more fun to work on quick projects that can be used right now, in the spring. These are five of my favorite milder-weather crochet patterns. The links to the free patterns are included, along with photos of some of my finished versions. I am also providing some notes about yarn choice and pattern tips. These little cuties come from the amazing Whistle & Ivy blog. I opted to make mine without the “dot” detail in the pattern, instead using a vibrant grape color and a basic white button. Once you get the hang of the teeny tiny shoe pattern, you will be able to whip up pairs of these in no time. I will say, for me, they ran small. I went up a hook size to achieve the correct measurement. This is such a fun project. This whale is whimsical and fun for any place in the house, but works especially well in a kids’ bedroom or bathroom. I thoroughly enjoy many of Moogly’s fabulous patterns, but this is one of my favorites. I use a tiny bit of black yarn to make the smile, and simple plastic black buttons for the eyes. The tail was the only slightly challenging aspect of this pattern. Otherwise, it is simple and fun. This tutu dress is great. I chose not to add the flower, because I opted for wild, multi-colored tulle in the skirt. It has a tie-back closure, so it can work for a variety of sizes, really. I thought this would make a perfect first birthday outfit, especially for a photo session. It would also be really adorable as a flower girl dress, which could be done in all white or the wedding colors. I didn’t follow the yarn and hook recommendations within the pattern. I used a light-weight yarn in a cotton blend. I also used an E or F hook. Gauge isn’t really important to this headband. The tie-back closure is cute, and it makes it work for any size. I think this headband is so fun, especially with the boho trend going on. It works with an everyday look, and updo, as a festival accessory, or even as a headpiece for a casual boho wedding. I like girly, frilly, feminine things. Pink and purple are my favorite colors, and I am a sucker for a ruffle. So, I created this pattern to fit those criteria and brighten up my house a bit. I like to choose three or four colors and make a set that coordinates. This makes a really nice gift for a bridal shower, hostess, birthday, mother’s day, etc. They work up larger, but because they are made with cotton, they’ll shrink once they go through the washer and dryer. I hope you enjoy making some of these things this Spring. If you do, I’d love to see your work in the comments. Also, feel free to share any of your favorite go-to patterns for the Spring season. 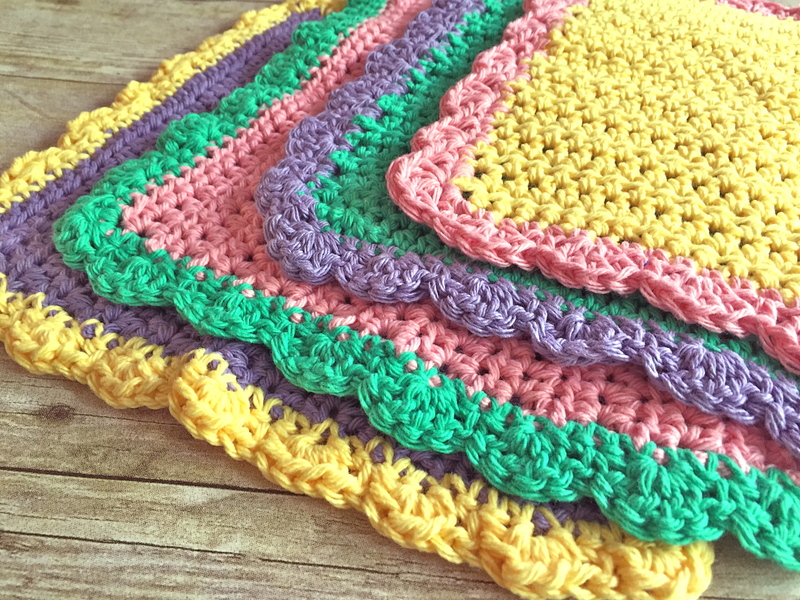 Ready for an easy, cute, and functional free crochet pattern? 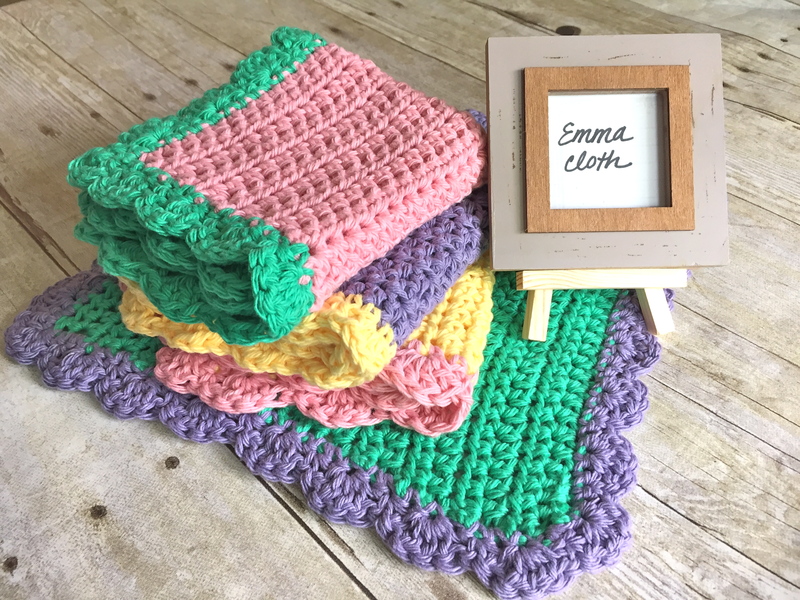 I am pleased to introduce the Emma Washcloth! I wanted to begin my free pattern series with something quick and fun, something that you can keep for yourself or give as a gift. 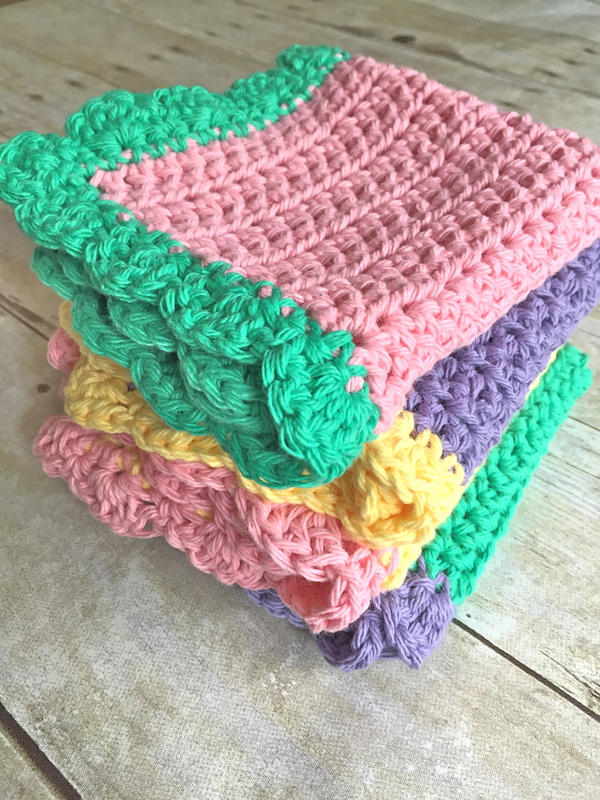 Easily customizable, this washcloth design will quickly become one of your go-to projects (it has for me). I couldn’t settle on one color combination, so I made several. I love the idea of mixing and matching colors, and I opted for a set of spring and summer-friendly shades to brighten up any home. 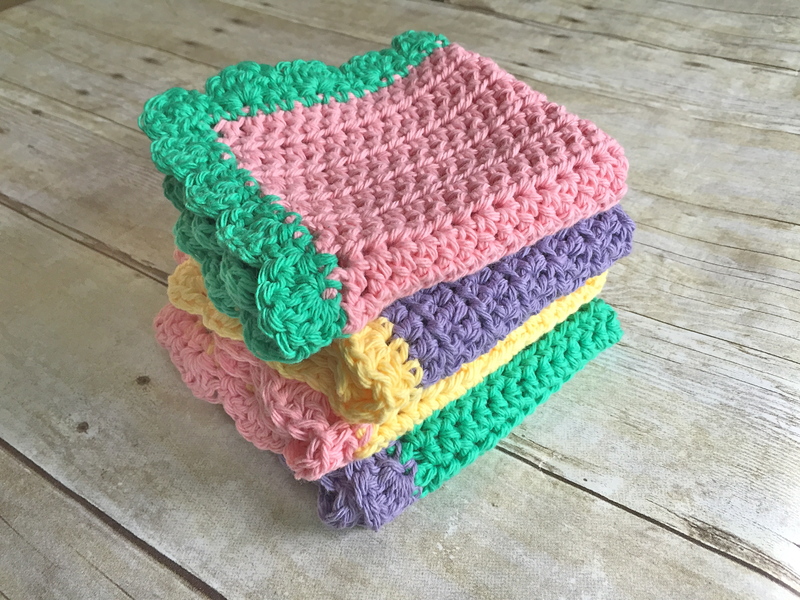 What makes this design really special is the feminine detail of the scalloped border, adding a decorative twist to a classic washcloth. Using a contrasting color for the border provides a whimsical, modern feel to a vintage-inspired design. This pattern is appropriate for beginners of crochet, and it can be completed quickly by those more experienced. I recommend using Lily Sugar ‘n Cream yarn, though any cotton, worsted weight yarn will do. 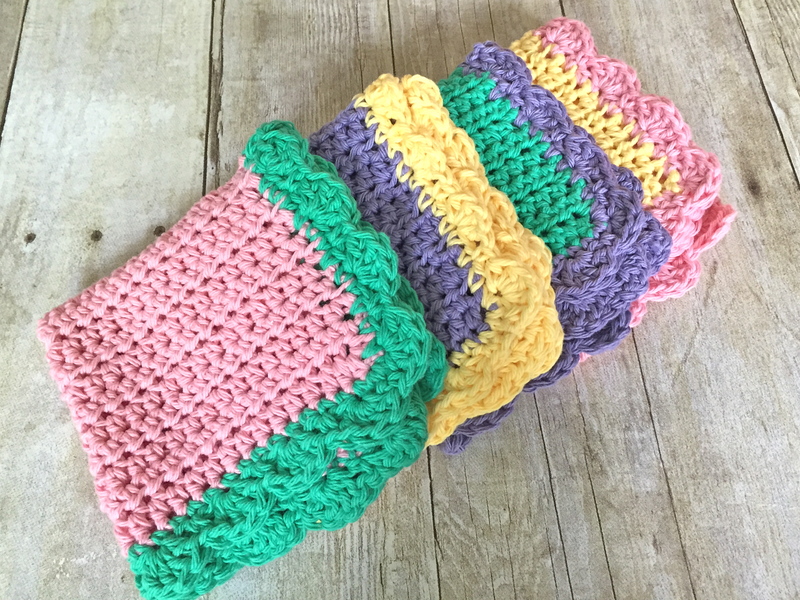 The colors pictured are: Mod Green, Hot Purple, Rose Pink, and Yellow. One 120-Yard skein will create a center of one washcloth and the border of another (with a little to spare). With First Color, ch 31. Repeat Row 2 until the piece measures 10.5 inches. Turn, joining Second Color in the last loop of the last stitch. Border: Chain 1. Turn the work so you are working along the side. 3 SC in the corner. SC evenly along the side to the next corner. You will have approximately 28 SC stitches along each side. 3 SC in the corner. Continue working around the piece, spacing SC around evenly and 3 SC in each corner. Join with a ss to the first SC stitch. You will have roughly 116 SC stitches, though it is okay to have a few more or less, as long as you have a multiple of 4. Ch 1. (1 SC, skip 1, 4 DC in next st, skip 1) around. Join with ss. Cut yarn and fasten off. Also, if you don’t want to make your own, you can purchase the entire set from SwanJay shop.